• On a warm day in May 1654, a Swedish ship dropped anchor in the Delaware River, North America. Four fourteen pound cannons took aim on a Dutch fort which threatened access to the colony of New Sweden. • The officer on board in charge of leading the onslaught was Captain Sven Skute from Dingtuna outside the city of Vasteras, Sweden. Also on board the ship "Eagle" was his wife, Anna Johansdotter from Nasby farm. • Now, I have come to this river that border Delaware and Pennsylvania, and met with descendants of that couple from "Dingtuna." I have also found a surprising connection to Vasteras and its surrounding farmland, to the American Declaration of Independence of 1776 and later, its Constitution. I look out over the Delaware River, which flows wide and yellowish green. By my side is 62 year old Carole Burnett-Cook. Interested in genealogy, Carole has figured out that Sven Skute from Dingtuna is her great grandfather. She lives in Newark, Delaware, just two miles from the spot upon which her forebears landed. To the left of where we stand, upstream, stands a highway bridge whose distant bending form disappears into the fog. Beyond this bridge lies the city of Philadelphia. To the right, a few miles down stream, the river widens as it opens into the Atlantic Ocean. Behind us lies the village of New Castle, Delaware. Some of the houses here date from the 1700's, which is considered very old by American standards. From where we stand, nothing is to be seen of the Dutch "Fort Casimir only grass and riverweeds are to be found here. Nearby, the Stars and Stripes billow in the wind. No "Fort Casimir," only grass and waterweeds. Still, it was here that it happened. It was here that the Swedes fought for the dreamed of Swedish colony. Carole Burnett-Cook, buffeted by the wind, listens but hears only seagulls. She pulls her coat closer around her body and reads the memorial placard, which tells of "Fort Casimir." Standing there, she thinks of her family from "Dingtuna." Anna Skute was pregnant while she stood on the ship that day long ago and watched as Sven was rowed in towards the fort. Anna Johansdotter had waited at home on "Nasby Farm" for Sven to come back from New Sweden, so far away from Lake "Malaren" and the North Sea. Now, he had fetched her and brought her here. Before any of this, Sven Skute had been a Cavalry officer in Finland. He had taken part in the 30-year war, and at its end as a reward, had been given the farm Nasby. Yet, the thought of a New Sweden in North America intrigued him. It was here by this river that the Swedish Colony had begun in 1638. Six years later, Sven had followed in another ship beginning a new chapter in his life. Here he became one of the leading officers under the fat, thick-skinned Governor Johan Printz. Sven's wife Anna was left to stay home alone in Dingtuna for seven years. When Sven Skute finally returned it was not only to reclaim his wife, but to carry out the orders of Governor Printz to find more people willing to come to New Sweden. It did not turn out too well for the Swedes along the Delaware River. The Indians were willing to trade, but the Dutch interfered and the Swedes were never able to make any progress in business and the economy faltered. Papers of the period indicate Sven Skute had the blessing of Queen Christiana to entice people around Vasteras to emigrate to America and New Sweden. He traveled through Bergrslagen and Varmland, and in February 1654, the vessel "The Eagle" finally sailed from Gothenburg. Tightly packed on board were 350 colonials and they watched as the Swedish coast disappeared in a snowstorm. Amongst them were Sven and Anna. Anna was to give birth in September in another time in another country. The journey took two and a half months and a hundred lives. Carole Burnett-Cook has a sore hip and starts walking back to the car. "What does it look like in Dingtuna?" She asks. I show here some pictures from Nasby, a road across the plains, a farm, some horses, and a clump of trees. "That could be Illinois," she responds. "Jido Castle isn't far from here" I tell her. "That's where Axel Oxenstierne lived." I tell her that it's peculiar how it all hangs together. Oxenstierna was "fiks kausler," very close to the king, and was very active in planning to make Sweden an important country. He would walk around the oak trees at Jido Castle while planning a great future for Sweden. He wanted a colony in America for Sweden. Christiana was only 12 years old when the first Swedes came to the country along the Delaware River in 1638, sailing in the vessels "Kalmar Nychel" and "Jagel Grip." The future Queen Christiana was only acting as Queen. It was Axel Oxenstrierne who was in charge of her and the country. He believed in the future power of Sweden, but the cost needed to achieve this was great and few of his fellow Swedes supported such a dream. The Dutch had established New Holland on Manhattan by the Hudson River, and they proved to be too competitive for the Swedes. 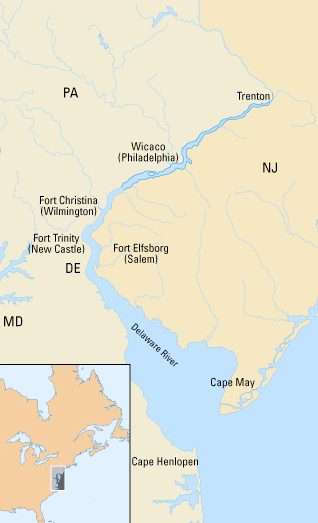 While Sven Skute and officials from New Sweden were home seeking more colonists to take back with them, the Dutch quickly built their Fort Casimir on the Delaware. This Fort now controlled access to the Delaware River. A model of this small fort stands in the market place at New Castle. The model shows a timber construction and palisades with walls of earth around it. A paper Dutch flag flies from a tower. "It ought to have been a Swedish flag" I tell the little old man who is a caretaker. He smiles in a friendly way. "Maybe so, the Swedes were here for 17 years while the Dutch only nine," he says. "I wonder what went through the heads of the Swedes when they saw the Dutch flag waving over the fort in 1654 when the 'Eagle' finally dropped anchor", says the American descendant of Sven Skute. Sven Skute had become a Captain. He was rowed ashore together with twenty soldiers. The new governor, Johan Rising, who was replacing the fat Printz, had stayed on board. Rising fired a warning shot from the ship that flew over the head of Sven. The Dutch Commandant had only nine soldiers and their rifles were at the blacksmiths - there was no powder in the cannons. It was now that Sven Skute entered history. He could have negotiated to achieve a working relationship with the Dutch. Instead he demanded capitulation instantly and the Commandant had no choice. The Swedish flag was hoisted and the Fort's name was changed to Fort Trinity. Sven Skute became Commandant and moved into the blockhouse with Anna. Governor Rising continued up the Delaware River to Fort Christina, where Governor Printz had lived. It was here that the colony of New Sweden's Capital was to be located. Carol Burnett-Cook, comfortably seated by the window, sips on a glass of white wine. Outside the restaurant there stands a statue of the Quaker William Penn, silently symbolizing that the fuss between the Swedes and the Dutch was just a prelude of what was to come. Sven and Anna lived in Fort Trinity for one year. After that came Peter Stuyvesant from New Amsterdam, the legendary man with a wooden leg. "You must meet Del, he is also a descendant of the Skutes from Dingtuna. Ask him about the Inkwell"
It was at the end of 1655 and Peter Stuyvesant was angry. He had sent for more soldiers from Holland and was sailing up the Delaware with seven ships and six hundred soldiers. The Swedish Colony had only three hundred and sixty eight men. Sven Skute realized the hopelessness of the situation, but did what he could as Commandant. He tried to make them fight. The soldiers refused. One of them tried to flee, but was shot dead by the second in command. The name of the soldier was Sabhid Forman and the only victim as New Sweden quickly capitulated. Captain Sven Skute surrendered September 1, 1755. His soldiers were put in jail. He was invited to dinner with Stuyvesant while soldiers with burning torches stood watch. Dingtuna was far away. Fourteen days later, the Swedish Fort Christiana surrendered, and New Sweden was no more. The Dutch were accommodating after their victory. The Swedes could choose between going home or stay under Dutch regime in "Upland." Sven and Anna had decided to stay. "If they hadn't done that, I would not have been sitting here today." It had grown dark over the river. "Did you know that they moved up the Schuylkill River? Del Conner knows about this. You must meet Del. He is also related to the Skutes from Dingtuna. Ask him about the inkwell," Carole says before we depart. J. Del Conner is 52 years old. He lives in a big historic house on the outer perimeter of Philadelphia. As we leave center city Del says, "There is where Anna and Sven lived" as he turns and points to the opposite side of the river. As I travel with him through Fairmount Park, the Schuylkill River flows by a countryside that sparkles with yellow and red leaves. It's the day after Halloween. Sven Skute seems to have built himself a mill. He was called "Sven the Miller" in later years. Sven's son Johan later bought more land further up the Schuylkill River. "Johans' land is over there," says Del, again pointing to the other side of the river. "We are now exactly on the 40th parallel. The same parallel that as the one that goes through Madrid" says Conner. I nod as if we belonged to a secret society where the meaning of the 40th parallel has a super secret meaning. We enter the steep Wissahickon Valley. The trees bend down towards the water. There are no houses here, only a park left to go wild. Del Conner also belongs to the branch of the family that comes from Sven and Anna's great granddaughter Elizabeth Warner, through their daughter Christiana's son Sven. Elizabeth married Philip Syng Jr. in 1730. Philip Syng, Jr. was a famous silversmith and activist who played an important part in Philadelphia's history. "Have you heard about the Independence Hall Inkwell?" Asks Del. Climbing out of the valley, we continue our drive to his house in Awbury Arboretum. After a brief tour of the house and grounds, we go upstairs to his second floor studio and he bends down beside a black iron plate. Del Conner designs and produces these cast iron-plates that are put into an open fireplace as decoration, to protect the bricks and to hold the heat of the fire. They're called 'Firebacks' in English. "Look at this one" he says. A shining sun is in the uppermost part of the fireback and below it are the words: "WE THE PEOPLE." These are the opening words of the United States Constitution. Below that stands an inkwell holding two proud quill pens. "That is the inkwell!" Well, Well. George Washington had dipped his pen in this inkwell when he signed the Constitution in 1787. So did Syng's friend Benjamin Franklin when he signed the Declaration of Independence in 1776. That's when, on the 4th of July, the American Nation was born in Philadelphia. What has this to do with Dingtuna? "Philip Syng made the inkwell and was married to Elizabeth Warner" says Del. Elizabeth's father's grandfather and grandmother were Sven and Anna Skute of Dingtuna. Del Conner looks at his papers and tells me that Elizabeth Warner Syng give birth to eighteen children. Their eldest daughter, Abigail, had married Edmund Physick, Proprietor General for the Penn family before the Revolution, and their agent until the early 1800's. 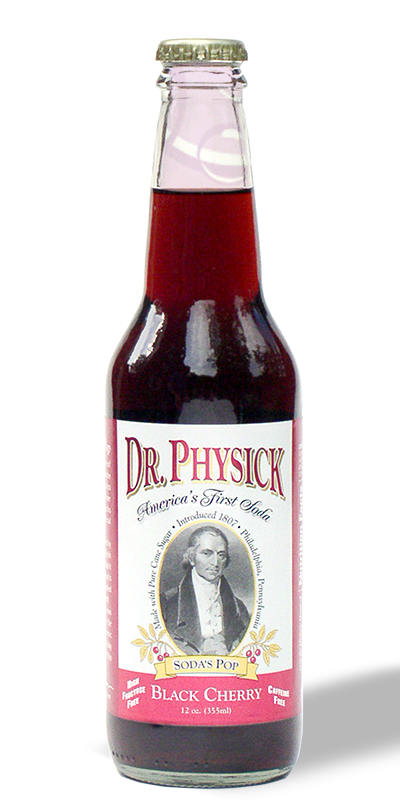 Their son, Dr. Philip Syng Physick, considered the best surgeon in the United States is known as the Father of American Surgery today. As such, he is a blood relative of that couple from Dingtuna. Remarkable how it all hangs together. As I drive back towards Delaware, I catch sight of a sign saying "Upland," and then pass a yellow school bus with the sign "Christiana School District" in big letters. I stand in a plaza surrounded by dilapidated buildings with the skyscrapers of Wilmington looming in the distance. It was at this place that the first contingent of Swedes came on aboard the ships "Kalmar Nyckel"** and "Fagel Grip. "*** It was here that they jumped ashore onto "The Rocks" that still can be seen on the shore of Wilmington today. The Rocks. There is a now a small park there in memory of the long ago Swedish dream of having a colony. The Park is squeezed between a chemical factory and railroad storage sheds. An Amtrack train rushes by. On the flat stone terrace stands a pillar with a remarkable figure on top. The sculpture portrays the ship "Kalmar Nychel" with all of its sails hoisted, surging forward. This is the work of sculptor Carl Milles. It was Milles who made the Statue of Johannes Rudbeckius that stands in front of the Cathedral in Vasteras. His patron, Sigfrid Edstrom, had made this river front monument possible following his retirement as director of the company ASEA. In 1938, with time to commit himself to civic projects, Edstrom had soon found himself responsible for planning the 300th anniversary of the Swede's landing in America. Back home in Sweden, Edstrom had successfully influenced the governor with a truly grand dinner at the "Riche," and arranged to have State funding for a celebration of the landing's anniversary. He even managed to convince Crown Prince Gustav Adolf and young prince Bertil to attend with about ninety other people who would sail across the ocean on the "Kingstrohn" to Philadelphia to participate in the event. Sigfrid was even able to arrange for President Franklin D. Roosevelt to come to the ceremony by the river in Wilmington. Unfortunately, the Crown Prince had taken ill before the ceremony and stayed at the hotel while Prince Bertil had to do the honors and thus gave the first long speech of his life. Dressed in parade uniform, President Roosevelt standing behind him with a raincoat over his shoulder, the sky opened and the rain poured down as he began his speech. Nevertheless, the Jubilee couldn't have been more festive. Sigfrid Edstrom was very pleased. He had even become an honorary citizen of Philadelphia, the city that William Penn started after having bought land from three brothers named Swenson, and the Sven Skute family from Dingtuna. Remarkable how it all hangs together. *The author wrote to Carole Burnett-Cook and Del Conner saying this is a bit of an overstatement but made for a good headline. **Kalmar is a city, Nychel is a key. ***Fagel Grip is a bird in the hawk family.